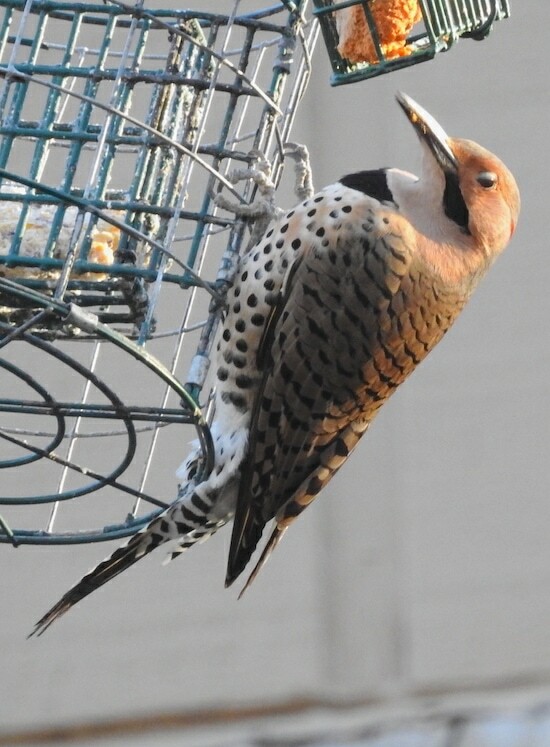 The northern flicker doesn’t have “woodpecker” in its name, but it is one. And what a distinctive one! Although the black-and-white stripes on its tail are reminiscent of other woodpeckers’ black-and-white checks, it’s polka-dotted breast is what makes it stand out among birds. Quite fashion-forward. Unlike most woodpeckers, they don’t peck much wood (though they will if they have to). They prefer digging for insects on the ground. I saw the individual above at the neighborhood’s most popular bird feeder, just on the edge of the woods. The black handlebars next to its beak indicate that it’s a male; other than that, females are similarly colored. They’re about the size of a robin. There are two main subspecies of northern flicker: the yellow-shafted and the red-shafted. The underside of the yellow-shafted northern flicker’s wings are bright yellow, and it’s found more often in the east. The red-shafted has red underwings and the males have a red mustache instead of a black one. 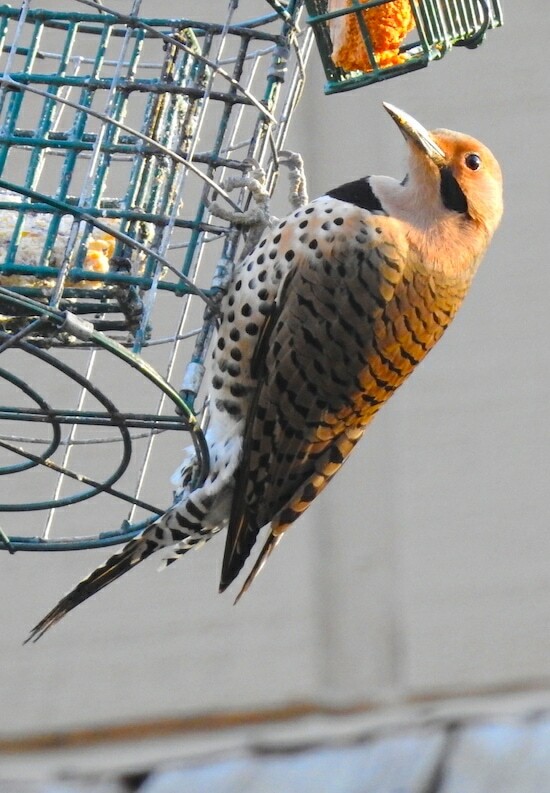 Red-shafted northern flickers are found more often west of the Rockies, though there is some overlap in their range. Part of my ongoing series of blinking-bird portraits. These birds are loud! On my way back from this feeder, when it was almost sunset, I heard a “Pew! Pew!” sound like an old Star Wars-movie laser shooter. I followed the sound for about a hundred yards and found a flicker, which immediately flew away. 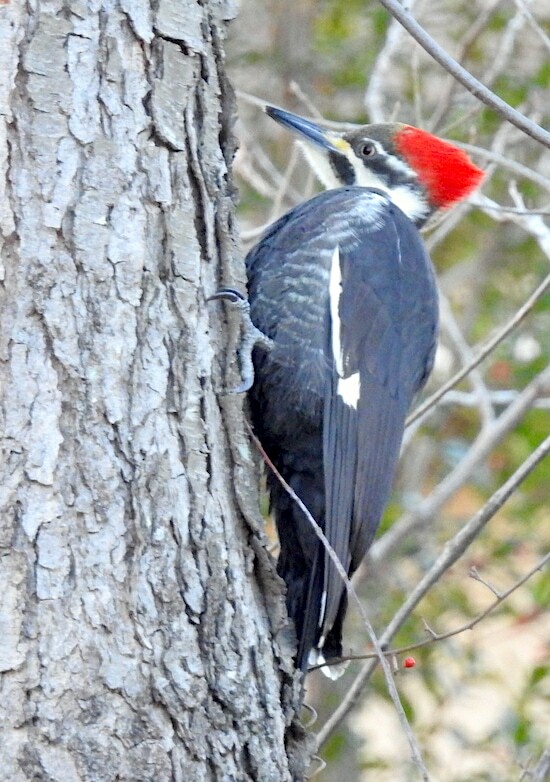 But at least it had led me to another pileated woodpecker.